Old News lost a vital member of the team this week with the passing of Wystan Stevens, the dean of local historians. Wystan generously shared his deep knowledge and love of Ann Arbor with Old News since its inception in 2010. He named unknown people, identified unknown buildings, streets and venues, gave context to hundreds of photos, corrected mistakes made by Ann Arbor News reporters and photographers as well as Old News staff. When it came to making sense of an old aerial photos, which is always hard, Wystan could sort out the direction we're facing, as well as what was to come. Check out his unbelievable commentary for the photos of Tappan Junior High School and Stadium Blvd. Wystan's contributions to local history go far beyond Old News. He contributed photographs to and research for the Downtown Historical Streets Exhibit Program as well as narrating the video introduction to the Streets Exhibit. And he donated his time and materials to the Ford Gallery of Ann Arbor Founders Exhibit. 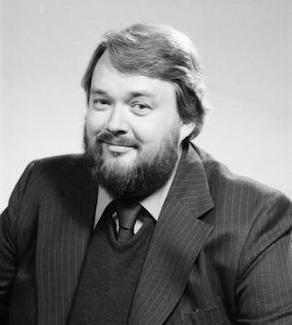 He even made makes it into our Old News UMS archive of historical programs as narrator in a program from 1979. Wystan authored, introduced, or had been a consultant for numerous books on Ann Arbor history in the AADL collection. He did workshops on books set in Ann Arbor, led tours of the city's landmarks, including his most famous and popular tour, the Forest Hills Cemetery. He was a favorite subject of Ann Arbor News photographers and his sense of humor came through in every photo. The official historian of Ann Arbor and the unofficial Old News historian will be greatly missed by all of us at Old News. Thanks for the memories, Wystan. Teens! It's not too late to volunteer at the library this summer! Hey there! If you're between the ages of 14 and 18 and looking for something fun to do with the rest of your summer, come volunteer at the AADL! We need help with all of the cool programs taking place throughout the month of August. All you need to do is fill out the information form at www.aadl.org/teenvolunteer and bring the signed permission slip that you'll find on that same page to the orientation taking place Downtown on August 3 from 2-2:30pm. At the orientation you'll get more information about volunteering, and have the chance to sign up for whatever programs you'd like to help with. There are opportunities at all our locations, and at lots of different times of the day! If you have any questions, email teenvolunteer@aadl.org or call (734) 327-8326. All AADL locations will be closed on Saturday, July 4. Regular Library hours will resume on Sunday, July 5. Today, June 30, is the last day of our fiscal year, and the year-end stats process on our Library automation system requires us to disable some functions. Starting around 9 PM tonight, Requests, Renewals, and your My Account page will be unavailable while the process is running. The catalog, website, and summer game will still be working through this time. We will have service restored as soon as possible before opening on Wednesday. Thanks for your patience, and thanks for using your library! The Washtenaw Library for the Blind and Physically Disabled at Ann Arbor District Library (WLBPD@AADL) received the prestigious National Award for Subregional Library of the Year today during a luncheon ceremony at the Library of Congress in Washington, D.C.
Library Director Josie Parker and Terry Soave, AADL Manager of Outreach and Neighborhood Services accepted the award on behalf of WLBPD@AADL, now completing its sixth year of serving blind and physically handicapped individuals throughout Washtenaw County. The other award presented at the luncheon ceremony, the Network Library of the Year Award, was given to the The Michigan Braille and Talking Book Library located in Lansing. Both awards carry a $1,000 cash prize and a framed certificate for each library and its parent agency. The Washtenaw Library for the Blind and Physically Disabled at Ann Arbor District Library (WLBPD@AADL) serves approximately 500 patrons and circulates talking books and magazines on 15,949 digital cartridges. All public services staff of the Ann Arbor District Library are trained and available to provide WLBPD services. For more information about WLBPD@AADL services, visit wlbpd.aadl.org or call (888) 460-0680 or (734) 327-4224. Teens! Come volunteer at the AADL this summer! Hey teens! Come volunteer at the AADL this summer! It’s a great way to meet people, see some cool behind-the-scenes stuff at the library, and earn volunteer hours! If you're between the ages of 14 and 18, all you need to do is fill out the form at https://aadl.org/teenvolunteer, have a parent or guardian sign the permission slip that you’ll link to via that page, and then come to any of the five orientations taking place throughout the summer. At these orientations, you’ll learn about what volunteering entails and have the chance to sign up for the opportunities you want to help with, including program prep work, stocking summer game orders, and assisting with a variety of programs themselves. If you’d like more information or have questions, email teenvolunteer@aadl.org. Hope to see you this summer! Psst! It's also a great way to get lots and lots of summer game codes, since every program you help with will have its own code! 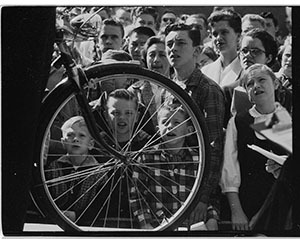 On Saturday, April 19, 1958 the Ann Arbor Police Department held a bicycle auction that drew a big crowd of bidders of all ages. The Ann Arbor News took a lot of photos of the event but only three made it into the April 21st edition. The human interest story concerned then eight-year-old Douglas Hehr and his almost-didn't-happen winning bid. We've published many of the photos that didn't make it into print and hope you recognize someone, maybe even yourself, in one of them. If you do, share your memories with Old News through the Add New Comment feature at the bottom of this blog. Don't forget that you can earn all kinds of cool prizes in the Summer Game when you share your local history knowledge with Old News. All AADL locations will be closed on Monday May 25 for Memorial Day. Regular Library hours will resume on Tuesday, May 26. Newspapers have to make tough choices about what photos to publish with articles and how to crop the photo to fit the space available. Old News has a lot more flexibility so we're publishing Mother's Day photos that did and did not make the cut. In one article the photo is cropped but we're publishing the whole picture and perhaps you'll recognize some of the other Ann Arbor High School students. Although the News usually picked the best photo from a shoot, sometimes we think the others are so darn cute we publish them all. We often don't have names to match the faces and they're too dear to be left anonymous. So if you recognize someone in our Mother's Day photos or have more to add to a story please use the Add New Comment feature to make sure Old News gets the whole story. Old News has published another trove of photos and articles on the Ann Arbor Police Department that were digitally "ripped from the front pages" of the Ann Arbor News. In June, 1950, Haven Hall was set ablaze by arson. The AAPD investigation led to a graduate student, Robert H. Stacy. Fingered by a girlfriend (who briefly disappeared during trial), Stacy confessed in October, recanted, and was convicted in December, 1950. Many of the photos published on Old News never made it into the Ann Arbor News. That's also the case with photos involving the murder of nurse Pauline Ada Campbell in September, 1951. The brutal homicide shocked the community and put everyone on edge. It took the AAPD only three days and a good tip to arrest three youths for the slaying. Crowds gathered daily outside the courtroom and legendary News photographer Eck Stanger was granted photo privileges unheard of today. The Ann Arbor Police Department Online History Exhibit houses hundreds of photos from the AAPD and Ann Arbor News including badges, weapons, and memorabilia from the men and women who were and are the AAPD. We're continually adding to the collection of Ann Arbor News articles about the department, the personnel and policing. There are three full-text histories including Mike Logghe's True Crimes and the History of the Ann Arbor Police Department. The Ann Arbor Civic Theatre is celebrating 85 years and AADL has launched a new website detailing the history of this award-winning local theater company. View hundreds photos from the rehearsals, backstages and performances of the plays including never before seen shots from noted photographer Fred Beutler as well as the staff photographers at the Ann Arbor News. The Archive also includes hundreds of posters and programs from plays and over a thousand articles from the Ann Arbor News. Old News will be adding more programs, photos and documents from the extensive collection at the Civic Theatre in the coming months but we need your help . . . can you identify any of the people in the photos where we don't have names? Everyone knows someone in Ann Arbor who worked in or for a Civic Theatre play, so browse the photos and add your knowledge in the Add New Comment feature. We have identified the lady at your left, that's Gilda Radner. Due to a power outage at the Downtown Library, all AADL locations closed around 7 PM friday night. Power has been restored, and we're in the process of bringing servers and building systems back online. All locations will reopen as normal at 9 AM Saturday. Thanks for your patience! 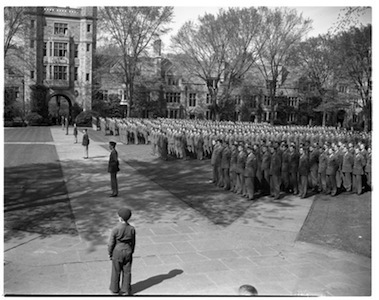 70 years ago, on April 14, 1945, Ann Arbor News photographer Eck Stanger took this photograph of a service parade in the U-M Law Quadrangle held in honor of President Franklin D. Roosevelt, who had died two days earlier. 60 years ago, the announcement of the success of the Salk polio vaccine took place right here in Ann Arbor. This momentous announcement followed one of the largest peacetime mobilization of volunteers in American history to undertake the 20th century's greatest public health experiment. Like many other community newspapers, the Ann Arbor News documented the determination of its citizens to fight polio, with feature stories on the afflicted and the swirl of local fundraising efforts to raise awareness, find a cure, and vaccinate area children. 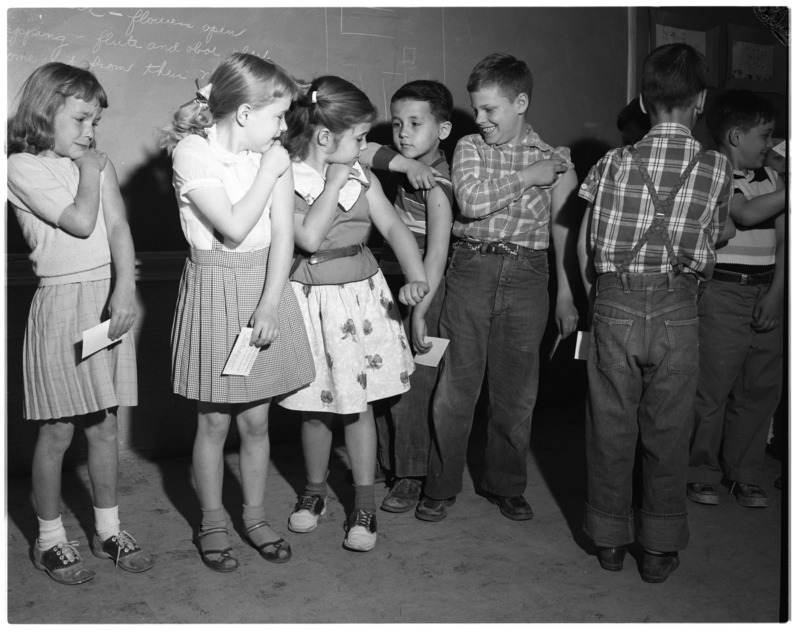 Local historian Grace Shackman has written a feature story on Polio in Ann Arbor for our Oldnews site, pulling together dozens of articles and photographs on the history of polio in our community and the announcement of the polio vaccine on April 12, 1955. Join us on the 60th anniversary, Sunday, April 12, for a special discussion at the Downtown Library with Dr. David Oshinsky, Director of the Division of Medical Humanities, NYU School of Medicine, Professor of History, and author of the Pulitzer prize-winning Polio: An American Story. The Ann Arbor Film Festival is here again, and with it comes another year of films, events, and community partnership. AADL will once again be an official AAFF community partner for Films in Competition 4, on Saturday March 28 at 11 am at the Michigan Theater, which features films especially for viewers and filmmakers age 6 and up. You can check out the list of films playing and buy tickets on the Ann Arbor Film Fest’s website. Make sure to enter the code AAFF53_AADL for half off your advance ticket – normally $6! When you come to the screening, you’ll even have a chance to hear the premieres of the film scores participants created in our Making Movie Music workshop, held in conjunction with the AAFF. The Ann Arbor Film Festival is the longest-running independent and experimental film festival in North America. The 53rd AAFF takes place March 24-29, 2015 and presents over 200 films from across the world with dozens of world premieres. For more information, please visit the Ann Arbor Film Festival’s website. The best way to celebrate and honor Black History Month is to delve into history. What better place to do that than the Library? This February, AADL has several events and resources to help you mark Black History Month by honoring those who came before, their traditions, and our hopes for the future. April Ryan, a 30-year journalism veteran, the White House correspondent for American Urban Radio Networks, and the only black female reporter covering urban issues from the White House has just released a new book, The Presidency in Black and White: My Up-Close View of Three Presidents and Race in America, a behind-the-scenes look at the inner workings of race relations as it relates to the White House. She will be at the Downtown Library on Monday, February 16 at 7 pm to discuss the book, her career, the three presidents she’s covered, and her experiences. The Sankofa Ensemble takes their name from a word that means “to retrieve the goodness from the past”. They will teach us about the traditions of Ghanaian and West African music and play authentic instruments from Ghana. Families will especially enjoy being able to get up and dance to the music, and learning more about traditional African dancing. The Sankofa Ensemble will perform on Saturday, February 21 at 2 pm in the Downtown Library’s Multi-Purpose Room. The last very special Black History Month event features the relatives of a prominent Civil Rights figure: Rosa Parks. Sheila McCauley Keys is Rosa Parks’ niece, and she and her siblings grew up very closely with their aunt when she moved to Detroit. They have recently released a new book of memories of their aunt, Our Auntie Rosa: the Family of Rosa Parks Remembers Her Life and Lessons, and Sheila will visit the Downtown Library on Tuesday, February 24 at 7 pm. She will talk about her new book and her Auntie Rosa, and she will take questions from the audience. Of course, libraries are fantastic resources for more than just events. Here at AADL, we have the African American Cultural & Historical Museum of Washtenaw County’s Living Oral History Videos. These are recorded interviews with local African-Americans discussing what they witnessed and experienced and their perspectives relating to race, gender, education, equality, faith, housing, employment, community building activities, and social infrastructure in our area. These amazing videos show what a historical resource our own people are, and make learning about history as easy as a conversation with your grandparents. Newspapers are also great historical resources. AADL has digitized copies of local abolitionist newspaper Signal of Liberty which was started in April 1841 and published almost every week from an office on Broadway Street in Ann Arbor. Issues featured local and national news, anti-slavery poems, interviews with emancipated slaves, minutes from anti-slavery meetings, and stories by abolitionists about helping people escape from slavery. Reading these articles helps us to understand issues surrounding slavery, why people opposed this dark part of our past, and how ordinary people participated in the fight for freedom. Whatever part of history you are interested in, your library is a resource for research, learning, and commemorating. Dating back to the Underground Railroad, Ann Arbor boasts a rich and vibrant history for African-Americans. A wonderful piece about this time in Ann Arbor’s history is written by Grace Shackman and can be found here. There are many African-Americans that created their own piece of history in Ann Arbor. For instance, you can read about Ann Arbor’s first African-American mayor, Albert H. Wheeler, first African-American teacher and later principal at Northside Elementary, Harry Mial and his wife, Joetta Mial, Huron High School's first female African-American principal. O.Herbert Ellis, who passed away last year is notable for being the first African-American to serve on and to chair the Washtenaw County Board of Commissioners. You can read more history and the individuals that created it here. AADL Songsters in the news! This week, the AADL was featured in the Ann Arbor Public Schools News when students from Clague Middle School performed in the Multi-Purpose Room as part of our AADL Songsters program. With their teacher Jeff Gaynor and local musician Nan Nelson, students learned to dance the Troika and perform two songs as part of a World Cultures and geography unit on Russia. Круто! Клево! Ann Arbor responds to the assassination of Martin Luther King, Jr. 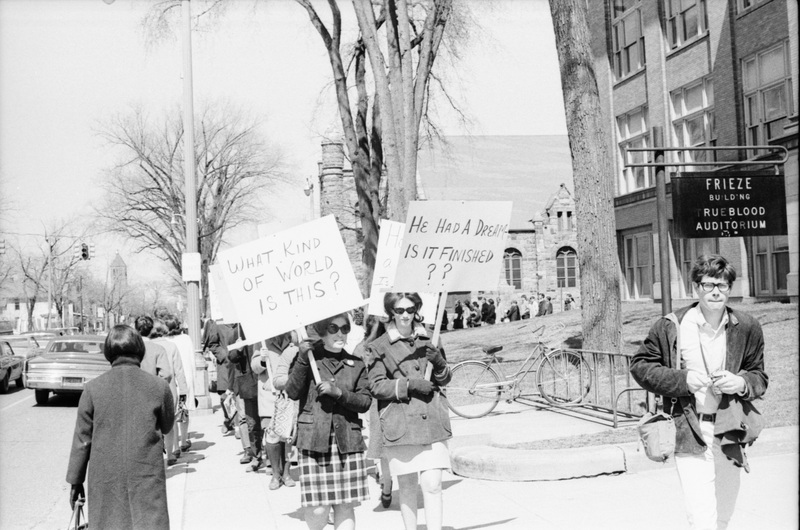 In the days following the assassination, Ann Arbor held a memorial at Hill Auditorium and Ann Arbor News photographers snapped dozens of photos of townies and students participating in marches and peaceful demonstrations. Here they are, for the first time, from the Oldnews archive. Due to power outages Malletts Creek and Pittsfield Branches are closed for the remainder of Monday, and will reopen at 9 AM Tuesday. Drop Boxes are still usable and today's items on the hold shelf will still be available all day Tuesday. Thanks for your patience! Did you know the first movie theatre in Ann Arbor was built on Main Street? Have you ever wondered how Ann Arbor got its name? Did you know the University of Michigan began its tradition in Detroit? Are you curious about Ann Arbor's activism roots? Or maybe you want to know about the history behind the arts, music, and culture in your city. You can find out all of these facts and more on AADL's Ford Gallery of Ann Arbor Founders. Don’t look now, Ann Arbor, but just in time for Halloween, we’ve unearthed a few frightening photos from our Oldnews vault. Did you know Ann Arbor had a Haunted Tavern? Or that a roving band of Devil Dogs terrorized Tree Town in the late 1930s? In 1945, a pirate, some clowns and...a singing cornstalk(?) took over the former WPAG radio station at Main and Liberty, and in 1952 Ann Arbor Civic Theatre conjured up this disturbing scene during its production of The Spider. We've also exhumed ample evidence that witches, goblins and other monster mites haunted the Burns Park neighborhood in 1951 and 1952. Similar creatures appear in a 1957 JCC Halloween Parade. And in 1964, this vampire stalked Art Fair booths. So click if you dare, Ann Arbor. You can browse all things Halloween or search the past at Oldnews - your gateway to Ann Arbor's hair-raising history. In honor of Dr. Jonas Salk's 100th birthday, we've just posted a few photographs and articles from our archives celebrating the life and legacy of Dr. Jonas Salk, the American medical researcher and virologist who spent time at the University of Michigan doing critical research on the influenza virus before inventing the first successful polio vaccine. On April 12, 1955, the vaccine was declared to be safe and effective and within weeks was being shipped around the world. Thu, 10/09/2014 - 8:30am by Debbie G.
Long, long ago in a galaxy known as the '60s, Ann Arbor's first head shop, Middle Earth , opened in a 2nd floor walkup on Liberty Street and then moved to its iconic location on South U. Owner Cynthia Shevel sat down with Old News last year to talk about the history of Middle Earth, how it changed over the years and the challenges independent shops face in Tree Town. Cynthia announced the closing of Middle Earth yesterday saying that with the closing of the Selo/Shevel Gallery a few months back, she and longtime partner Elaine Selo will begin a new phase of their lives. The owners of one of Ann Arbor's signature stores, Falling Water Books & Collectibles, just announced they will be closing after 26 years. Here's a 1988 article and photograph (left) from the store's grand opening in July of that year. Falling Water was first located at 318 S. Ashley St., and later moved to Main St.
Mon, 09/29/2014 - 7:54am by Debbie G.
On a cold and windy October 9, 1964, a small group of speakers and community members gathered in front of the new senior citizen apartment high-rise, Lurie Terrace, to celebrate its completion. No one was more instrumental in bringing Lurie Terrace to completion than Shata Ling. Mrs. Ling founded the Ann Arbor Senior Citizens Guild in 1956 and worked tirelessly on behalf of seniors throughout her active career in Ann Arbor. Lurie Terrace was named in honor of Mrs. Ling's mother, Ann Przzan Lurie. Lurie was one of the first affordable senior housing projects proposed in the U.S. In 1961 a site on W. Huron was selected and demolition of four homes began. Bricks from the Lorin Mills House were used to construct the patio at Lurie. Designed by local architect James H. Livingston the building featured twin Pentagon towers. The first resident to sign a lease at Lurie Terrace came from a family with a long history in Ann Arbor, Pearl McOmber. From the beginning, Lurie Terrace emphasized a vibrant and varied lifestyle for seniors with a workshop, a plant conservatory, small dining halls, library, men's club, even an in-house "Newsboy". Lurie was not without controversy and in February, 1982, three years after a woman was denied admission because she was handicapped, the Michigan Court of Appeals struck down Lurie's residency requirements that prohibited handicapped persons. Over the years, Lurie developed programs and social events that aimed at expanding horizons of all seniors in their community of apartments. Happy Birthday Lurie Terrace! Wednesday, September 24, AADL hosted two very prestigious visitors from Ghana. Nana Afia Adoma II, Queen of Antoa-Krobo in the Asnate Kingdom and Nana Kwadwo Nyantakyi III, Chief of the Treasury in the Asante Kingdom were at the Downtown Library discussing African culture. They spoke, through a translator, about their customs and traditions, such as how their royal garments are made, sharing that garment patterns hold special meaning. It can take weeks to weave the cloth. They also explained that drumming is an integral part of the culture and that drumming is used as a form of communication. The Royal couple will be back to the Downtown AADL on Wednesday, October 8 at 7 pm to discuss Royal instruments and West African Music. The event was cosponsored by the U-M Center for World Performance Studies and the U-M Stearns Collection of Musical Instruments. The Downtown Meeting Room was packed for Tom Hayden's lecture Monday evening, September 15. Hayden, a former student at U-M was in Ann Arbor because U-M has recently purchased papers, photos and documents which detail his life as an activist. He stated that "history repeats itself if all parties aren't involved, even dissenters," in creating the future. He will be visiting the area once a year for 4-5 years to decipher his hand-written notes accurately because they include so many primary sources. MLive reporter Janet Miller wrote a detailed story on his lecture you can find here. Fast Company, the award-winning national business magazine focusing on technology, business, and design, just released an online article about public libraries, highlighting AADL and its unique collections. In the publication's Elasticity section, highlighting innovative businesses using the cloud and big data to stay in sync, the article Taking A Long-Overdue Sledgehammer To The Public Library describes how libraries are "lending tools you can't 3-D print -- awls, hammers hacksaws, mood synthesizers and human skeletons -- to keep pace with the times." Deputy Director Eli Neiburger describes AADL's Unusual Stuff to Borrow collection and how "Ann Arbor launched its collection of objects three years ago with 30 telescopes. Soon, the waiting list grew to more than 100 people. Encouraged by the telescopes' success, the library added tools, giant-sized games, musical instruments" and more. "Libraries have always been a place to access rare, hard-to-find objects." Eli states. "Commercial books aren't rare, hard-to-find objects anymore, so library collections are being used in different ways." Wed, 08/27/2014 - 9:15pm by Debbie G.
Sept. 1, 2007 is the day that the lowly Mountaineers of Division I-AA Appalachian State came to Ann Arbor and laid low the mighty Wolverines of the University of Michigan, 34-32 in the home opener. Ann Arbor News sportswriter John Heuser wrote: “It may be the biggest upset in college football history, a Division I-AA team from the foothills of North Carolina wrecked Michigan’s season opener and made national headlines, shocking the Wolverines in Michigan Stadium.” Until then, no Division I-AA team had defeated a ranked Division I-A opponent since the inception of I-AA in 1978. Fans were livid, angry at coach Lloyd Carr. One fan, Cam Swift of Grand Rapids said, “They obviously didn’t prepare the kids for the game. I think it’s time for Lloyd to go. We’ve had too many disappointments under him.” One fan quipped. “Lloyd Carr is an inspiration to me and many other Ohio State fans.” Jim Carty also opined in his column that Carr was losing his touch as a coach. Despite the final score, Mike Hart had an excellent game. After missing most of the second quarter with a bruised hip, he returned to run for 131 second-half yards and two touchdowns. He put his team ahead with a 54-yard run with 4:36 to play and finished with 188 yards and three touchdowns on 23 carries. In Boone, N.C., Appalachian State students were dancing the streets. They grabbed a goalpost and dragged it down Main Street. One senior said, “This is my humble opinion: This is the biggest thing to happen in Boone. News football writer John Heuser gave the team a failing report card with Fs in defense, coaching and overall. The next week, the LOSS was still the news when the Wolverines were about to face the Oregon Ducks and Ducks fans were quacking about their improved hopes for a victory. And what a victory it was. The Ducks added insult to injury by beating the Wolverines, 39-7.